House Gymnastics has over 25 different moves to perform. 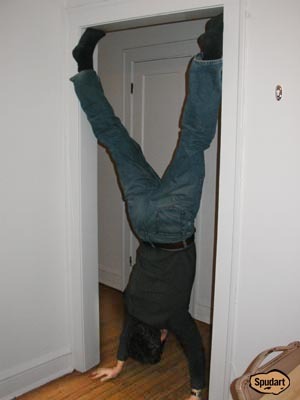 Perform a basic handstand within a conventional doorframe and then move hands and feet to the corners of the frame, thus creating an X shape. Join the spudart updates group to get email updates when I add more stuff to my site.